Evangeline was the heroine of an epic poem, written by Henry Wadsworth Longfellow in 1847. The poem described the forced migration of 6000 French settlers from Acadia, Nova Scotia in 1755 and their hardships. Many resettled in Louisiana. Evangeline was a bride who was torn away from her groom on their wedding day, found him again years later, but tragically, could not reunite due to intervening events. Later versions of the story said she spent her remaining years grieving under a tree, which became known as the Evangeline Oak. Her statue under the tree can be seen today in St. Martinville, LA. 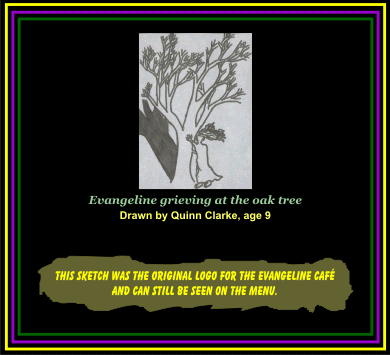 That oak tree and statue are shown in the drawing to the left, which was done by Quinn Clarke, 9-year old son of the restaurant owner, Curtis Clarke, and is used as a logo on the menu. CAJUN is the popular term for those Acadian people and their culture, as they blended with the new environment in Louisiana and developed cooking menus that are used authentically in this restaurant.